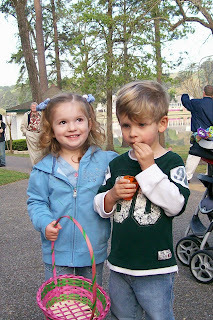 Kaelin and Dawson waiting for the egg hunt to begin. Dawson having a good time and laughing with his best friend, Kaelin. 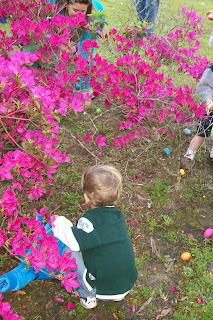 Digging through the bushes to get some eggs. 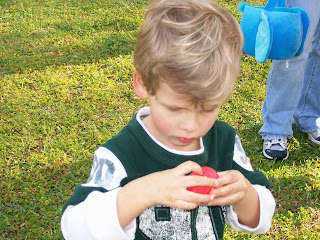 Trying to open his dinosaur egg. Showing off his bounty. 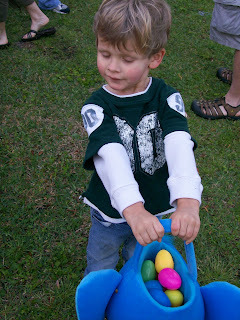 The interesting thing is that he really likes searching for eggs and even enjoys opening them up to see what's inside, but he won't eat any of the candy - unless it's a sucker, the only kind of candy he will eat. Funny about the candy. Jonah tells us he wants the candy, then when we give it to him, he chews it once and spits it out! It's fun (insert sarcasm here)!! However, he does like chocolate. 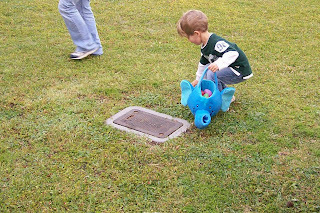 He had a big marshmallow Easter Bunny in his basket. Loves it -- doesn't like sharing with the rest of us! 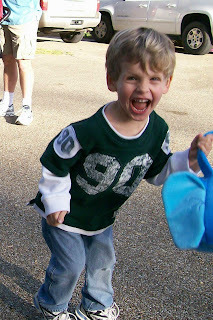 I love the picture of him screaming with joy- that's too cute!